Last week, quite a large group of locals turned up at Sidings Community Centre to hear a presentation from the developers and architects of the 187-199 West End Lane site. It was chaired by Frances Wheat, Head of Development Control at Camden’s planning department. Full minutes will be written up, and I’m not going to try and cover everything that was discussed in the session which ran for two hours. I’ve already covered the basics elsewhere, so I’ll try to shed some light on some other issues that arose and set the context very briefly. The area around the three stations (known as “The Interchange”) has been designated as an area for intensification in the Mayor’s London Plan. That’s a done deal – the expectation is for 800 new homes by 2015. Therefore, land such as this strip which runs between the underground and the overground lines will be developed for housing, but the scale and type are not set in stone. The boards that were exhibited beforehand are now accessible on the architect’s website (see these for issues I haven’t covered here, for example the parks, gardens and environmental issues, or site constraints). Some changes have been made since the last designs were discussed – the “public” square (presumably private space) has been made bigger to accommodate potentially the fillip that is a farmers’ market, and more smaller retail units have been added. First up, perhaps the most controversial of the issues: the height. There was quite a lot of confusion and, I have to say it, obfuscation, on the part of the architects here. At the exhibition the previous weekend I’d been told point blank that the highest building would be 11 storeys. Yet, JamesEarl from Fortune Green Residents Association had been told it would be 12 storeys. It’s a fairly basic fact without much room for error. You’d think. As Eric Holding, architect at John Thompson Partners ran through his presentation he rather hurriedly said that the highest building would be 11 storeys “from West End Lane”. When it came to audience questions, the first was: “how high are the buildings?”. No clear answer was forthcoming, with talk about the top floor being set back from the sides of the buildings, and the land sloping away, and no flats on the ground floor. The audience was getting a little irate, and it took someone (me) to shout rather loudly “how many metres tall is the highest building from the ground to the roof and how many storeys is that?” before we finally got an answer: 36m high, 12 storeys. So there we have it. That’s the height of the highest building, which would sit in the middle of the site. “From West End Lane”, it will have a relative height of 11 storeys because (presumably) the plot is about 3 metres lower than the road level. Everyone clear now? Why the developers would think that evading the question (or giving the wrong facts) would be helpful or win sceptics over when we’ll find out eventually is beyond me. The heights are also notable by their absence on the exhibition boards. The building heights running east to west (away from West End Lane) are 15m (5 storeys), 24m (8), 30m (10), 36m (12), 30m (10), 24m (8) and then a longer block that looks to be 6 or 7 storeys high at the back of the site. They explained in more detail why they had decided to go for this ‘rise and fall’ design rather than having the buildings rise steadily with the tallest block at the back or have a uniform height across all the blocks. Some of this was aesthetic, and I agree that their design is more pleasing this way. This also means that the 30% of affordable housing that the scheme proposes can be in family home-size dwellings at the back of the lot rather than somewhere in the middle dwarfed by blocks around them (more on this issue later). There was also the issue that if the tallest building was at the back it would block the light (think of those lovely whampsunsets) from the rest of the site. They also argued that the trees that flank the site (none of which are actually on the site and thus their long-term future cannot be guaranteed) give adequate screening for the larger buildings, although the photographs that tried to prove this were taken before the leaves began to come off the trees – they said they would be taking pictures again in winter. There was understandable concern from residents in streets that are closest to the site about the effect on their light. The developers explained that they had tried to take natural breaks in existing housing into consideration – but it feels like this issue could run and run as it may well have a big impact on some houses. In total, the development will have around 200 units (roughly equal to 540 people). I asked what was driving the total number of units – i.e., why 200 not 230 or 170, and what the minimum number of units would be that would still give the developers a reasonable return. Naturally the second part of the question was ignored, as I expected (and having asked a question (and heckled to get a straight answer over height) I was subsequently passed over for more questions, which was frustrating as both my other questions were very straightforward). The answer to my first about driver of total size was a bit vague, but talked about the need for housing in the area, balancing the affordable housing requirements, the need to make a profit (absolutely valid) etc. It also pointed out that the density (594 habitable rooms/ha.) was below the legal limit of 700 that the site could take. This didn’t convince everyone in the audience and there were mumblings of “why are you doubling the height of West Hampstead’s buildings”. Architecturally, the buildings seem reasonable. Unlike the initial proposals for the Iverson Rd garden centre site with its bizarre aeroplane wing roof, these are fairly simple blocks, and are a modern attempt to reflect the traditional red brick and white render of much of the area’s long-standing architecture. Given the noise from the trainlines, the apartments will have internal cooling systems so windows can remain closed, although lots of flats will have balconies, for those who really like to hear the trundling of trains. Corner balconies also reduce the visual boxyness of the buildings. Thirty percent of floorspace is designated as affordable housing, split into 25 “intermediate” units and 20 “social housing” units. Note that Camden’s guidelines are for 50 percent affordable housing (by floorspace not no. of units) in mixed-use developments, which this falls well short of. As I understand it (and happy for someone to correct me as I’ve not had time to wade through the reams of planning docs. ), developers who fall short of the guidelines may be/are? asked to pay the council a set amount based on a formula that is put towards building affordable housing elsewhere in the area. Cllr Mike Katz pushed for more details on the decision to keep all the affordable housing at the far end of the site, suggesting this might not aid what he termed “community cohesion”, ie., the integration and mix of people that generally leads to more harmonious social outcomes. 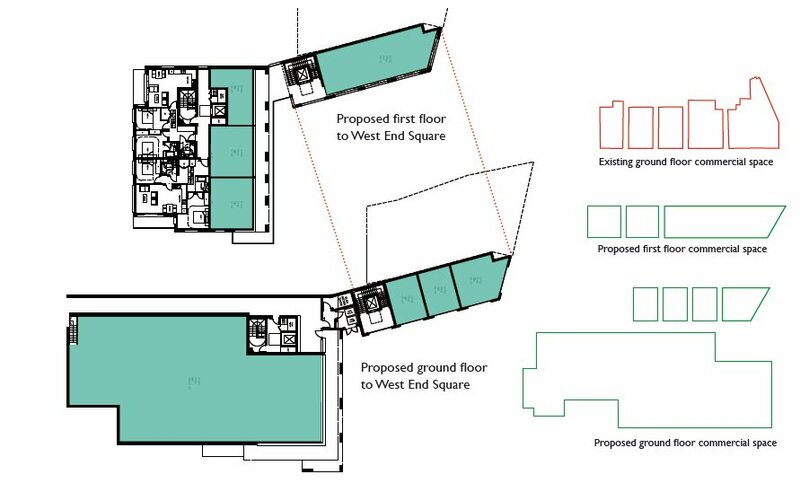 To the developers’ credit they had quite a full answer to this, and referred largely to the specifics of the site: the end location would allow for gardens attached to properties rather than the communal gardens and “pocket park” that sit between the other blocks. 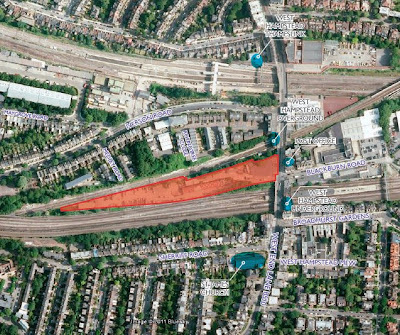 This relates to the elevation relative to the railway lines and at ground level this would be the quieter end of the site (note that an “acoustic wall” will flank the southern side of the site using foliage as sound proofing against the noise of the trains). This is clearly seen more as family housing than single occupancy housing. It would be interesting to know, however, whether the developers have looked at integrating the non-family affordable units into the other blocks rather than forcing all the less affluent residents into the far end of the site. The development is classified as “zero parking”. It won’t surprise you to know that this doesn’t mean no parking. There was will be 20 disabled parking bays, five car club spots (enlightened), and five commercial parking spaces. Residents will not be allowed to apply for parking permits on nearby streets. The developers argued that given the site’s current use as a car wash and repair yard there would actually be less traffic once the development was finished than there is today – suggesting an 85-90% reduction. It’s true that there is a steady flow of traffic into the site today, but hard to believe that lots of the residents won’t be ordering their parcels from Amazon, or their shopping from Ocado, Tesco and the like. Not to mention service vehicles, refuse collection etc.. It may not be a increase in traffic, but I would like to see the evidence that leads to the conclusion that there would be such a large drop in traffic. In addition the single road that would run the length of the development will also be the pedestrian access for the whole site, but I wasn’t able to ask whether it would be a single track or a two-way road. A question was raised about whether residents who needed vehicles for work – e.g., tradesmen, would therefore effectively be excluded from moving to the development if they couldn’t park. There seemed no clear answer to this. 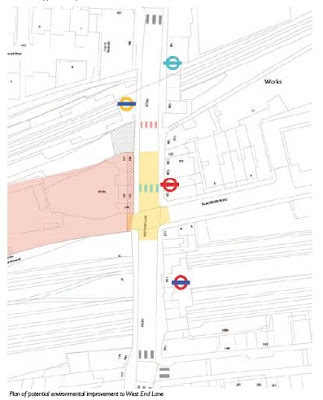 Part of the scheme involves changing some of the West End Lane streetscape around the interchange. The zebra crossing by the Overground would be replaced by one more or less where Rock hair salon is now, and the newish southbound bus stop (long fought for by WHAT) outside the post office would be moved further north to roughly where Greene & Co. is. The idea of moving the bus stop prompted outrage from some in the audience, given the battle they’d had to get the new stop put in in the first place and there was a rapid assertion from Camden and the developers that these proposals were in their very early stages. The zebra crossing makes sense, but I didn’t understand the rationale for moving the bus stop. As we know, right now there are six businesses with West End Lane frontage on that site, from Café Bon to M.L.Estates, as well as the auto-related businesses behind including the motorbike shop and the repair business. The buildings they inhabit would be replaced by “West End Square”. 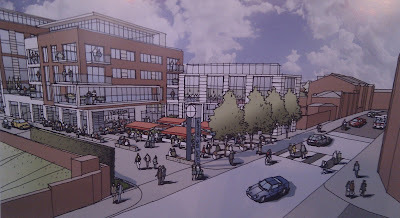 There will be seven smaller retail units in the new development as well as a large 600m2, which is metro format supermarket size – and, if I understood correctly, one of them will be let only temporarily because it will need to be demolished at a later date because of something to do with the Overground station infrastructure. Apologies for the lack of clarity here, this was the second question I wanted to ask but wasn’t allowed to. I have followed up with JTP and am waiting for them to get back to me. The architect argued that the number of units on the site was rising from five to seven (they are counting Rock and the car hire place as one unit I presume), but this clearly doesn’t translate into seven similar permanent small units for these or similar busineses to occupy. The exhibition boards say “There could be scope for some of the existing retailers and businesses to take new premises in the scheme and the developers would be happy to discuss potential tenant requirements at the appropriate time“. I find the plan for the shops baffling in terms of the first floor and ground floor plans. I look forward to being enlightened on this. Do the ground and first floor plans on the left match those on the right? There will also be 650m2 of commercial office space. It seems that this could be used for all manner of purposes and would not necessarily be let to one business but might be shared use (in theory this could be a great idea for shared office space for local independent sole traders – a business hub sort of thing, but I’m getting ahead of myself). There were inevitably questions about the construction itself, which would take place in two phases and if all went to Ballymore’s plan would start in spring 2013 and take two years. The idea of both the Blackburn Road development and this overlapping should alarm anyone who already finds West End Lane traffic a problem. The site’s location between rail lines limits the access points, and cunning ideas like adding a tunnel from Iverson Road were rapidly ruled out on cost grounds. Overall, the audience was initially respectful, with a few exceptions. As the meeting went on, things became a little more confrontational, and some frustration was directed at the chair who some thought was moving things on a little too quickly, not allowing all questions to be asked or pursuing answers adequately. Of course some people just wanted a good old rant and were inexplicably permitted to do this on more than one occasion, which meant other people’s legitimate questions were missed out (I’m not just talking about me here by the way). Sadly, not all the members of the panel looked as engaged as they might have done when not speaking. As one woman in the audience pointed out “We actually live here, it’s not just a ‘place with great transport links’, it’s our home“, and it does feel insulting if the people planning large-scale changes don’t at least pretend to be interested, even though I’m sure there are plenty of things they’d rather be doing on a chilly Wednesday night in November than dealing with a bunch of disgruntled locals. Credit to David Laycock, from Ballymore, who did in fact make an effort to engage throughout. What do I think? As longer-term readers know, I tend to try and be reasonably balanced on such matters, especially those where emotions can run high. 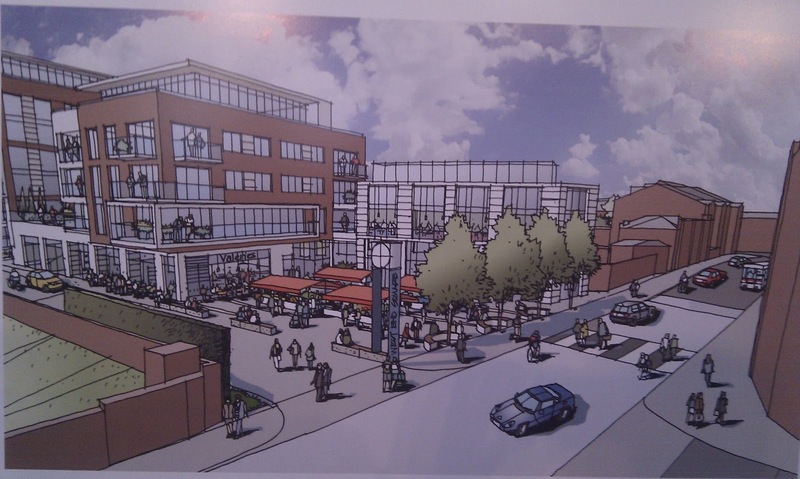 I don’t oppose development on the site, and I think that there are some good ideas within these proposals. I think the height is a major concern, as it is out of keeping with the character of the area (reference to the 8-storey student accommodation being built is fair, but that is on lower ground still, so “relative to West End Lane” it won’t be as dramatic), and has the potential to affect some properties’ light quite considerably. I also hope that existing businesses are given first option to take over the retail premises and that the inevitable and justifiable increase in their rent is realistic. I do wonder whether in shooting for such high buildings, the developer is prepared for a challenge and will be happy to “compromise” at e.g., 10 storeys, which might have been just as hard for people to swallow had it been the initial proposal. But then I can be very cynical. I also hope that if the height IS a problem, the retail spaces aren’t sacrificed for extra flats in an attempt to recoup any lost profit. I think that West End Square has the potential to be an asset to West Hampstead. It will vastly improve the image of the area for those arriving by tube and, together with the large open space by the new Thameslink station, it gives the community more flexibility for events, markets etc. I’m also acutely aware that given that this area is earmarked for intensification, the developers have a trump card up their sleeves. Should Camden refuse the plans that will be submitted later this month, an appeal to City Hall could see them passed anyway with fairly minimal concessions, which was what happened to the Blackburn Road student residences. Tom tries Costello West Hampstead schools – what’s the future?